Vault of Light: Believing my own lies finally cost me 92k - Onyxian Drake. Believing my own lies finally cost me 92k - Onyxian Drake. For as long as I can remember I've lied to myself about things I'm going to do in WoW. I don't lie on purpose. It's not a lie when I say it. I just get really distracted and I'm pretty forgetful. That right there is also a lie. I know damn well it's a lie when I say it. I know I'll never follow though! When Blizzard announced account wide mounts and pets I was stoked. I've always had to obtain mounts and pets on my Priest. I was gutted when I got Reins of the blue drake on my Druid from Occulus during Wrath of the Lich King. I hated doing raids or instances that had a chance to drop a mount on any character besides Korla just in case! However once the account wide announcement came it meant I could do those instances on any character and ultimately it wouldn't matter. I'll do Onyxia every week on at least three characters - Haven't done it once. I'll do ZG HC on my Hunter every day for both mounts - Did it for three days then never went back despite loving that Panther! I'll do Kara on at least five characters per week. (I have around 30 capable of Soloing Attune) - I did it for the first two weeks then stopped. I'll do Stonecore normal five times until I get locked out every so often - Stone-what? Stone-where? Yeah I've never done that either. On Monday night after tending to my crops I ventured over to the Black Market auction house as I often do if I'm in Valley of the four winds. To my surprise there was an Onyxian Drake. I've never seen one of these on the BMAH. As it was on a very long bidding and knowing it'd still be there in the morning I decided to go to bed and check on it when I woke up. By Tuesday morning the price hadn't moved much so I placed a bid and went offline, when I returned I'd been outbid but the auction was now on between thirty minutes and two hours I decided to bid again and spent the next two hours leveling six battle pets to twenty five around the BMAH area. I won the mount in the end for ninety two thousand. This gives me something I won't do to cross off of my "I might do" list and I've made the gold back since then. So my Warrior gets to enjoy a new mount! Onyxian Drake - 92k gold worth of lazy! Have you bought anything off of the Black Market auction house? Ours rarely seems to have anything of much interest on it. I'd love to see an Ashes of Al'ar but that's another thing I promise to farm every week and then don't! Are you good at sticking to your own plans? Huge Grats on the mount! 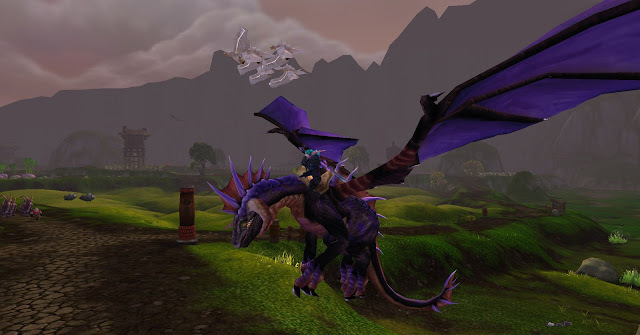 I had the same 'problem' as I got the Ony drake on an alt, but thankfully account wide mounts have saved the day. Oh definitely! The only pets that show up on mine are Cat Carriers! I'd snag those two in a heartbeat as well, congrats! Hear, hear. Your first 3 paragraphs completely described me. Except for the Attumen (which I finally got bout a month ago!) I'm just too lazy/forget to do anything that I should. It is such a beautiful mount. Congratulations that sounds like such an excellent Christmas present from Blizz and a great memory! I actually told myself I'd do onyxia on all of my capable toons every week. I started last week, we'll see how long I keep it up. I've been working on getting 5 spirit beasts on my hunter so I can solo dreamwalker in ICC, solo the LK and open up heroic mode for the following week, I NEED Invincible! I always forget to do Heroic Magister's Terrace, Stonecore, the one for the blue proto drake, the one that's south of Uldum for that drake, and uhhhh... I'm sure there's more. I've seen Ashes of Alar and the Onyxian Drake on the BMAH recently, and some 535 bracers for my hunter, but I refuse to buy anything from the BMAH until I reach gold cap. I'm always spending too much gold or giving it away because I 'quit' playing the game. Just checked the BMAH for today, there's 535 boots for my hunter AND the picnic basket! Grrrrr it's too tempting! Good luck with your mounts! Oh god, I forgot about UP for the blue proto! Have you tried the new porcupine pets spirit beasts? There's one in Jade forest, Krasarang and Storm peaks. Pretty easy tames, just gotta kite. All three are spirit beasts and fast respawns. Yep, got those three and Gondria from Zul'Drak. I spent quite a few hours this past weekend bouncing around Northrend and Mount Hyjal, looking for spirit beasts. One more and I can extend my raid lockout. I wish I had a better computer so I could record my 25 Heroic Lich King attempts and hopefully a kill. *waits for wish to be granted* ..... Aaand I guess my genie is broken :( oh well. I'm glad I could remind you about the blue proto from UP. Also, thanks for reminding me that it was UP, game related stuff is slipping my mind at the moment. OOOH! I just remembered that I finally got whatever drake it is from 10 OS3D this past weekend as well! I did it on 25 last year some time and finally remembered that I needed to do it on 10 man as well. I think I need a 'TO DO' sticky on my monitor! I frequently 'lie' to myself about things I'm going to do. I normally start off well with good-intentions to carry on running dungeons/raids for mounts and/or pets but after a few weeks I'm bored and forget about it. Someday I may get the nerve to drop 100k on a BMAH mount but I like my gold so much. Grats on the new mount! Thanks Jim! Ack, I felt the same when I first hit gold cap. I was like, can't go under, can't go under! But then I did and nothing bad happened and I got the gold back! So now I don't mind doing it, thankfully! I've used the bmah to gear up a bit after a break from the game. Got 2 pieces that helped me become lfr eligible a while back. Ah sweet. I haven't bough any gear really I probably should to get my Paladin into LFR.